Pico-Car is a consumer oriented site that promotes environmentally and economically responsible means of transportation. 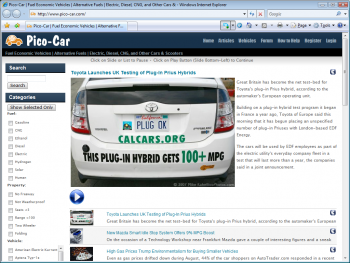 It provides information and news articles related to fuel efficient vehicles and community discussion forums. Pico-Car differs from other sites in three important ways. First, the information about vehicles is compiled manually from multiple articles and sources and presented in a concise form. A reader can get the same information elsewhere but only after reading multiple articles. Second, the entire site content is categorized by a human site-editor ensuring consistency and relevancy across the content. Third, the content is presented in form of slide shows so that a reader can get the information with the least effort.